The Keithley 6517A is available to buy refurbished used or rent, usually from our UK stock. Click here to download the Keithley 6517A datasheet. Keithleys 51/2-digit Model 6517A Electrometer/High Resistance Meter offers accuracy and sensitivity specifications unmatched by any other meter of this type. It also offers a variety of features that simplify measuring high resistances and the resistivity of insulating materials. With reading rates of up to 125 readings/second, the Model 6517A is also significantly faster than competitive electrometers, so it offers a quick, easy way to measure low-level currents. We offer the refurbished used Keithley 6517A Electrometer High Resistance Meter for sale and rental. The Keithley 6517A is fully tested and refurbished in our in-house ISO9001 calibration laboratory. We supply manuals, accessories, full warranty and a free-of-charge Certificate of Conformity. We can also provide the Keithley 6517A with a fresh calibration for a small additional charge. 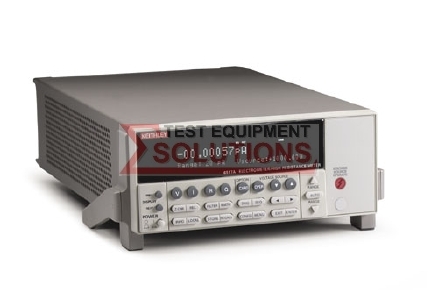 If you have under-utilised test equipment talk to us about trading-in or part-exchanging it towards the Keithley 6517A or other refurbished test equipment.